The Parson Russell is somewhat the action hero of dog breeds. The reason for this is because they thrive when presented with an adventure or given a chance to explore. High action activity is preferred. This breed is highly intelligent and is considered very trainable. It tends to react more positively when presented with other dogs than most terriers do. It can still act skittish towards dogs that it does not recognize. As for human interaction, it does great with strangers and even children. Its thirst for adventure fuels this positive interaction. This breed however, does not like cats for any other reason but to chase. It has the same type of interaction with rodents as well. It is definitely recommended for an active home due to its abundant amount of energy who is constantly looking for entertainment. The Parson Russell needs mental stimulation every single day. It is a very mentally active dog and in order to stay healthy, its mind needs to stay active. Along with the mental upkeep of this breed is also the physical upkeep. As long as they are exercised everyday, they will most likely remain healthy. Suggested exercises are this breed are long walks, a strenuous game, followed by a training session. This will not only work out the dogs body, but also its mind. This breed is not meant for homes that have little or no mobility, nor are they meant to stay cooped up in a small-sized apartment all day. It needs room to roam and things to explore. As for coat upkeep on the Parson Russell, it only requires brushing to nix the dead hair; its coat rarely gets knotted. Health concerns with the Parson Russell is not as major as they are within other breeds. Most dog breeds are susceptible to getting CHD, or Chronic Hip Dysplasia, in their later years, but this has actually steered clear of the Parson Russell which is an incredible advantage. However, its knees are susceptible to patellar luxation. This occurs typically in middle-aged Parson’s and affects the way the knee cap connects to the dog’s femur. This can cause extended lameness in the dog if not treated properly. Minor eye issues have also been reported in Parson Russell’s such as lens luxation, glaucoma, and ataxia. To avoid these diseases from setting in and causing damage, it is important to get your dog regularly tested for eye and knee issues. If kept healthy, most Parson Russell’s live to about 13 to 15 years of age. The Parson Russell was derived in the mid 1800’s by the Parson John Russell of Devonshire; this is who the breed was named after. He developed this line of terrier to keep up with horses while still being able to help the hunters hunt. Despite the instant success of this breed, it was not until 1998 that this breed was admitted into the Terrier Group within the AKC. 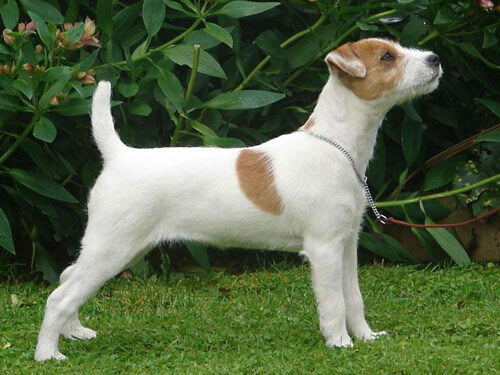 It’s elongated name, which is more recognized in the states, is the Parson Jack Russell Terrier.